Today’s organizational leaders must be able to motivate and engage employees to reach their highest levels of performance. Leadership coaching is one of the most powerful tools that a leader has to achieve these results. Coaching took on a more positive and less stigmatizing role when business conditions evolved again. As the pace of change quickened (often as the direct result of technological innovation), as organizations increasingly found themselves operating on a global scale, and as global competition increased the rate and scope of work, they could no longer rely on the vagaries of time and experience to develop their leadership talent. The following steps describe the basics of our behavioral coaching process. Every coach in our network has to agree to implement the following steps. If the coach will follow these basic steps, our clients almost always achieve positive change! Leader Coaching delivers three major benefits. First, it takes a comprehensive approach to coaching so that coaching not only improves individual performance but impacts the entire organization. Second, Leader Coaching ties coaching outcomes to organizational strategy. Coaching is often tactical in orientation. 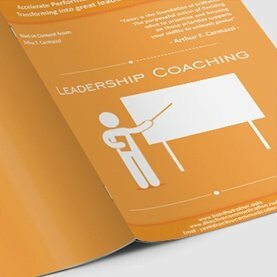 Third, Leader Coaching supports the development of an organization – wide coaching culture.